5 Reasons A Dentist in Collierville Takes Your Blood Pressure! There you are at your bi-annual checkup and cleaning. Since it’s not your favorite place to be, you’re hoping it’s over as soon as possible. But before you’ve even gotten started, the hygienist wants to take your blood pressure. Why? After all, you’re at the dentist, not the doctor’s office! It might seem like blood pressure has nothing to do with your oral health, but your mouth is connected to the rest of your body and vice versa. Not only that, people assume their dentist only cares about their teeth, but in fact, they care about your overall health as well! Keep reading to learn about five of the most important reasons to have your blood pressure taken at a dentist in Collierville. Since so many people see a dentist every six months, it’s a perfect opportunity to screen for high blood pressure. If you haven’t seen a medical doctor for several years, you could have undetected high blood pressure and be at risk factor for serious health problems. Remember, high blood pressure is a “silent disease.” There’s no indication of having it, yet it can be life-threatening. At the same time, taking a patient’s blood pressure is very easy and takes only minutes, making it a no-brainer! Since high blood pressure is silent, it can do a lot of damage to the blood vessels, heart, eyes, kidneys and more before it’s finally detected. For every day that someone has high blood pressure, damage is being done. The sooner it’s found, the less damage that occurs! If you’re having a dental procedure that requires anesthetic, a dentist needs to know your blood pressure to determine which anesthetic to choose. Some options contain epinephrine to help them last longer, but unfortunately, it can cause a rapid heart rate in some patients. High blood pressure combined with a rapid heart rate is often uncomfortable and, in some cases, dangerous. By detecting high blood pressure beforehand, another anesthetic can be used to avoid this situation altogether. Some patients don’t normally have high blood pressure but will develop it temporarily before dental visits. By screening them at the start of their appointments, they can be alerted to the need for stress management techniques that they or their dentist can implement to make dental care easier and more comfortable. 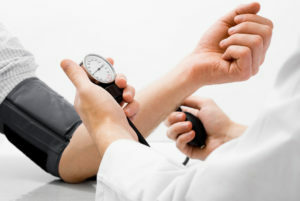 There have been cases where a patient has been found to have dangerously high blood pressure at a dental appointment. In these situations, a dentist will recommend that they seek medical attention immediately. This practice has literally saved some patient’s lives by preventing a stroke, aneurysm or heart attack. Remember, it may feel like a hassle or seem unnecessary, but having your blood pressure taken by a Collierville dentist is incredibly important! Dr. Joshua Holcomb knows that dental visits are a perfect opportunity to screen for high blood pressure, so he and his staff take it every time. He wants to make sure his patients enjoy a long life of great oral health and great overall health. If you have any questions, he can be contacted via his website or at (901) 850-0300. Comments Off on 5 Reasons A Dentist in Collierville Takes Your Blood Pressure!